Armed with a newly invented material called the Menger Sponge, a team of scientists led by Hashimoto captures the energy of a ghost child. In an effort to learn about the ghost's past, they enlist the help of special agent Ye, a member of the JCCU (Joint Crime Crackdown Unit) with an extraordinarily gifted eyesight. Reluctant at first, Ye himself haunted by guilt, struggling from within on how to let his own dying mother go, accepts the assignment, perhaps, to seek salvation from what the ghost child may reveal about life, and life after death. Ye sees a single strand of silk connected from the ghost to a mysterious power. Tracking the strand of silk, Ye learns the horrifying truth of the child's death. Fearing that the ghost child is dangerous, the team decides to isolate the ghost but in doing so they unknowingly unleashed the mysterious source on the other end of the silk strand, a much more powerful and ferocious energy. Most of the recent Asian supernatural horror films were a dismaying bunch. 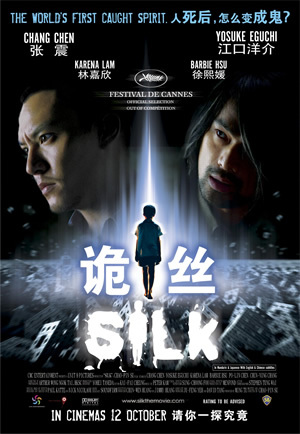 The only thing that piped my interest in Silk, the latest supernatural horror flick from Taiwan, is that actor Chang Chen was in it. Even though it has made its rounds at the recent Cannes Festival, it was Chang Chen’s impressive selection in his filmography that interested me into watching this movie. In Silk, he played Detective Ye who is blessed (or many might think, cursed) with the gift of extremely sharp eyesight and the ability of lip-reading. In the ghost world created by this movie, the scientists managed to invent a material called “Menger Sponge” that is able to trap energy from a ghost but humans are unable to hear what the ghost is saying. Detective Ye’s abilities are soon picked out by Hashimoto, the leader of a group of scientists, as they need to investigate the ghost child’s past and the reason for it’s existence when hardly any ghost exists that long after death. Now is this seemly ghost child vicious? That is the question that Detective Ye posed to the group of scientists before taking up the mission and anyone who has watched any horror movie in recent years would know the answer. This is one lonely sad child ghost but it does not appreciate disturbances from the human world and if any human comes too close for comfort, let’s just say there will be a hefty fine to pay and not one that can be paid by money. The fright factors in this movie are a mixed bag. There are some intense moments where this reviewer’s pulse raced, often becoming enthralled with the character’s risky encounters with ghouls. Then, there are some moments where it just felt too comical: a ghost coming out from a beef noodle bowl? That scene just doesn’t cut it as a decent frightful moment at all and felt like a lame spoof of Ringu (The Ring). It also seems that after the classic Japanese supernatural horror, Ringu, all victims of Asian supernatural horrors have to die with the same contorted look on the face that is just getting tiresome. Besides the emotional tale of the ghouls, the subplot of Detective Ye, his unconscious mom who is dying and estranged old love, brews into satisfying fruition of touching moments between lovers and family members at the climactic ends. There are times where we wish to communicate with the departed but there is simply no way of doing it in reality. Only in movies are we offered a peek of what could be the last possible message that the recent departed wants to say. In the beginning of this year, I caught a Taiwanese supernatural horror, The Heirloom which bored me to tears. I had almost written all Asian supernatural horror off until Chang Chen’s Silk came along and resuscitated my faith in Taiwanese films. While Silk handlings of fright moments were uneven at times, the heart of the story and the way it was delivered kept me engaged through all.